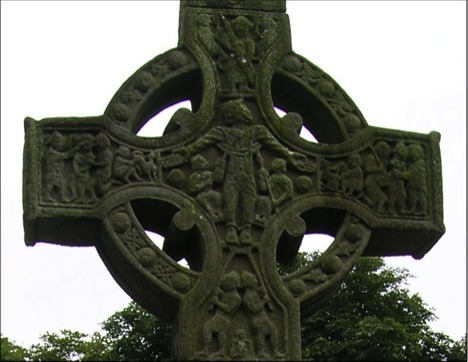 This page highlights Images from Holy Week that appear on the Irish High Crosses. The events of Holy Week, the last week of Jesus' life, are central to the Christian message. The makers of the Irish High Crosses included some of these events while completely ignoring others. Featured here are images from eight events that took place between Palm Sunday and Good Friday before the Crucifixion. The Crucifixion and Resurrection will be dealt with in two additional features, yet to come. A number of events are not illustrated on the High Crosses. Images from Holy Monday like Jesus cursing a fig tree and from Holy Wednesday such as the anointing of Jesus at Bethany and Judas agreeing to betray Jesus are absent from the High Crosses. Images from Holy Week pick up again Holy Thursday when Jesus is arrested in the Garden of Gethsemane. However, Thursday events including the Last Supper and Jesus' prayer in the Garden of Gethsemane do not appear on the crosses. Following the Gospel of Mark, in so far as possible, we will examine the Holy Week texts that do appear on the crosses. You will find the Text; at least one Image with a description; a list of other High Crosses that include this image; and an Interpretation of the event based on modern scholarship. It is worth noting that the Gospel of Mark is the earliest of the four Gospels. Mark was written around the year 70 of the common era. For a contemporary discussion of the day to day events of Holy Week see The Last Week by Marcus Borg and John Dominic Crossan. The liturgy of the early church began to emphasize this last or "Holy" week by at least the mid 3rd century. When they were approaching Jerusalem, at Bethphage and Bethany, near the Mount of Olives, he sent two of his disciples and said to them, ‘Go into the village ahead of you, and immediately as you enter it, you will find tied there a colt that has never been ridden; untie it and bring it. If anyone says to you, “Why are you doing this?” just say this, “The Lord needs it and will send it back here immediately.”’ They went away and found a colt tied near a door, outside in the street. As they were untying it, some of the bystanders said to them, ‘What are you doing, untying the colt?’ They told them what Jesus had said; and they allowed them to take it. Then they brought the colt to Jesus and threw their cloaks on it; and he sat on it. Many people spread their cloaks on the road, and others spread leafy branches that they had cut in the fields. Then those who went ahead and those who followed were shouting, Hosanna! Blessed is the coming kingdom of our ancestor David! Hosanna in the highest heaven!’Blessed is the one who comes in the name of the Lord! 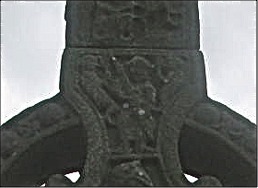 The image to the left is part of the Broken Cross at Kells (County Meath). About the broken panel at the top Helen Roe writes, "Enough remains of this badly mutilated panel for the subject to be identified as the Entry into Jerusalem, the opening scene of the Passion series. As the writer of the Gospel of Mark tells the story, Jesus enters Jerusalem on the Sunday before the Passover. On that same day, the day following the Jewish Sabbath, it is probable that Pontius Pilate, Roman governor of Idumea, Judea, and Samaria also entered the city. It was typical for Roman governors to be in Jerusalem for the Passover, to personally handle any problems that might arise. "As Mark tells the story in 11:1-11, it [Jesus' entry into Jerusalem] is a prearranged ‘ counter-procession.' Jesus planned it in advance." (Borg and Crossan pp. 3-4) The procession follows the pattern of Zechariah 9. "This king, riding on a donkey, will banish war from the land -- no more chariots, war-horses, or bows. Commanding peace to the nations, he will be a king of peace." (Borg and Crossan p. 4) This interpretation of the Entry into Jerusalem highlights the contrast between the Kingdom of God and the kingdoms of this world (specifically the kingdom ruled by Caesar). It suggests that Jesus was aware of the political and spiritual significance of his actions. Immediately, while he was still speaking, Judas, one of the twelve, arrived; and with him there was a crowd with swords and clubs, from the chief priests, the scribes, and the elders. Now the betrayer had given them a sign, saying, ‘The one I will kiss is the man; arrest him and lead him away under guard.’ So when he came, he went up to him at once and said, ‘Rabbi!’ and kissed him. Then they laid hands on him and arrested him. The writer of Mark does not offer any explanation of Judas' motives for betraying Jesus. For Mark the important point to make is that it is one of the Twelve Disciples who betrays Jesus. In oppressive regimes trust is undermined. Fear of informants becomes a part of everyday life. Friends and family members may be guilty of betrayal. (Perkins, p. 700) Members of the church at the time of the writing of Mark's Gospel were experiencing persecution and experiencing the betrayal of family and friends. But one of those who stood near drew his sword and struck the slave of the high priest, cutting off his ear. Then Jesus said to them, ‘Have you come out with swords and clubs to arrest me as though I were a bandit? Day after day I was with you in the temple teaching, and you did not arrest me. But let the scriptures be fulfilled.’ All of them deserted him and fled. The story of a bystander (presumably a disciple) cutting off the ear of the High Priest's slave raises more questions than it answers. Why was a disciple armed? Was this common practice? Could it have been a long knife such as the peasantry carried under their tunics rather than a sword? (Grant, 886) Is this another example in Mark of the failed discipleship of the Disciples? (Borg and Crossan, 124) As little attention as most commentators give to this particular episode the surprising thing is that this one sentence merited a panel on at least one of the High Crosses. Peter Harbison's description of the image [above] follows the Gospel of John. John is the only of the four Gospels that names Simon Peter as the one who wielded the sword. Among Celtic Christians the Gospel of John was a favorite. The first trial of Jesus was before an unidentified group of Jewish religious leaders.. Following the testimony of a number of false witnesses Jesus seems to declare himself messiah. “you will see the Son of Man seated at the right hand of the Power”, and “coming with the clouds of heaven.” Then the high priest tore his clothes and said, ‘Why do we still need witnesses? You have heard his blasphemy! What is your decision?’ All of them condemned him as deserving death. Some began to spit on him, to blindfold him, and to strike him, saying to him, ‘Prophesy!’ The guards also took him over and beat him. 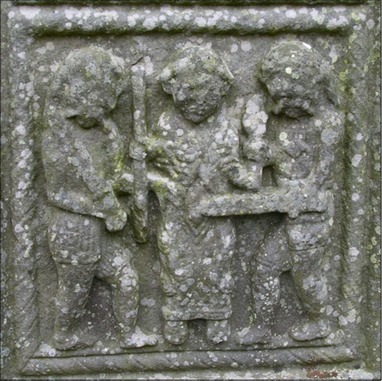 One of the three or four examples of this image appears on the Tall Cross at Monasterboice (County Louth) below. Either interpretation makes sense in the context of the other scenes on the head of the cross. On the right arm we have the betrayal of Jesus by Judas. On the left arm we have the mocking of Jesus. In the center is the crucifixion. If Harbison’s interpretation is accepted we have yet another scene related to the arrest and crucifixion. If Roe’s interpretation is accepted, we have a metaphorical statement about the meaning of the crucifixion. Other images of Peter's Denial can be found on: the Market Cross at Kells (County Meath), also in the constriction of the arms; on the Durrow Cross (County Offaly); and perhaps on Muiredach's Cross at Monasterboice (County Louth). (Harbison 1992, p. 267). This particular section of Mark emphasizes Peter's denial of Jesus. He says that he does not know him. This denial follows two other scenes. First, Peter follows Jesus to the house of the High Priest. Next we have Jesus' own confession (as undertsood by the High Priest) that he is the Son of God. This leads to his condemnation and first mocking and flaggelation (see above). Jesus' courageous response to the High Priest is followed immediately by Peter denying Jesus before bystanders. 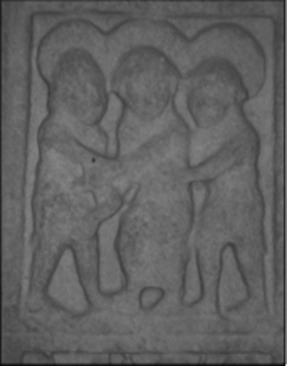 The image of Pilate washing his hands (of responsibility for the death of Jesus) appears on only two High Crosses: Muiredach's Cross at Monasterboice (County Louth) and the Durrow Cross (County Offaly). 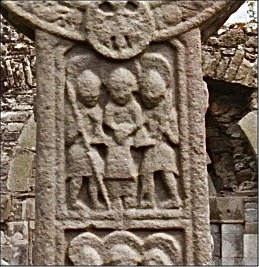 There is a possible third occurence on the Tall Cross, also at Monasterboice. It is unlikely that this event actually took place. It almost certainly has its origin with the writer of Matthew. He was looking back to the Jewish War of 66-74 CE mentioned above (Peter's Denial of Jesus). Tension between Jews and Christians was high. Jewish Christians in Judea and elsewhere were being excluded from the Synagogue. This meant thier worship was not sanctioned by Rome and was thus illegal. But the end result of the Jewish War was the defeat of the Jews and the destruction of Jerusalem and the Temple in the year 70. Christians of the time saw this as punishment for the Jewish condemnation of Jesus. It is important to note that this passage has been taken across the centuries as a sign of the guilt of all Jewish people of all time. It is said they condemn themselves by denying and condemning Jesus. But instead, we must read this text in the context of the times outlined above. The Christian movement was in the process of breaking with Judiasm and was seeking a legal status within the empire that would end persecution from that corner. Eugene Boring writes about the spiritual dynamics of the situation as follows: ".. . one should see this scene as the confrontation of two kingdoms . . . the options of royal power exerted through violence and the authority and power of God present in meekness . . . " (Boring p. 487) Matthew tells us that the people, or their leaders, choose violence over the God's kingdom. At first glance the images of the Second Mocking appear to be essentially the same as those of the First Mocking and the Arrest of Jesus. 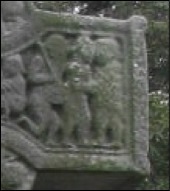 Peter Harbison's description of the scene as it appears on Muiredach's Cross at Monasterboice (right) points to the differences. 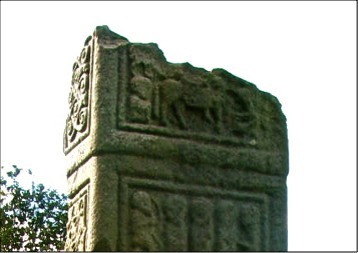 This image appears on the cross at Arboe (County Tyrone), the South Cross at Castledermot (County Kildare), the Donaghmore Cross (County Tyrone), the Drumcliff Cross (County Sligo), and Muiredach's Cross at Monasterboice (County Louth). It may also appear on the Market Cross at Kells (County Meath) and Larger Cross-head at Ardane (County Tipperary). The society of which Jesus was a part can be described sociologically as an "Honor-Shame Society." The entry of Jesus into Jerusalem on Palm Sunday to the acclamation of the people testifies to the high honor status Jesus had achieved. His status far exceeded what would have been expected for a village carpenter. In order to deal with Jesus' popularity, the authorities had to destroy his honor status. This process can be described as a "Status Degradation Ritual." In the scenes above, beginning with Jesus betrayal and arrest, he is subjected to one degradation after another. In the case of Jesus, this process begins with his arrest. It continues with his hearing before the Jewish authorities. His first mocking and flagellation complete the first phase of his degradation. This is followed by his trial before Pilate and the charges made against him. In an ironic twist of affairs, the crowd comes to demand the release, not of Jesus, but of a criminal named Barabbas. The irony is that the name Barabbas means "Son of the Father." According to the Gospels Jesus is in fact the Son of God (the Father). The degradation of Jesus then continues with his second mocking and crucifixion. All of his supporters have fallen away and the crowd has turned against him. The final degradation is crucifixion itself. It was so shameful that in most cases even the family never mentioned the person again. The victim had lost all status and become a nobody. They compelled a passer-by, who was coming in from the country, to carry his cross; it was Simon of Cyrene, the father of Alexander and Rufus.Then they brought Jesus to the place called Golgotha (which means the place of a skull). And they offered him wine mixed with myrrh; but he did not take it. And they crucified him, and divided his clothes among them, casting lots to decide what each should take. 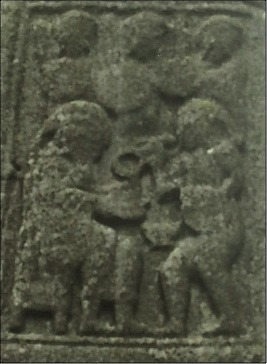 According to Harbison, this image appears only on the Cross of the Scriptures at Clonmacnois (County Offaly), the Durrow Cross (County Offaly) and possibly on the Tall Cross at Monasterboice (County Louth). The casting of lots for Jesus' clothing, or the division of his garments among the soldiers, is probably a historical fact. The clothing was the spolia, and belonged to the executioners of the prisoner. It is possible that this was actually done before the journey to the cross. The prisoner was typically led naked to the site of crucifixion. (Grant, p. 903) The inclusion of this brief statement in Mark's Gospel serves a deeper purpose than the recitation of history. It is one of several references in the story of the crucifixion to Psalm 22. "As part of the Jewish Bible, Psalm 22 is a prayer for deliverance. The prayer describes a person experiencing immense suffering with intense hostility. . . Though he has trusted in God from birth, now in his extremity he is scorned, despised, and mocked. He feels abandoned by everybody, friends and God. (Borg and Crossan, p. 158) In Psalm 22:18 we read: "They divide my clothes among themselves, and for my clothing they cast lots." Borg, Marcus J. and Crossan, John Dominic, The Last Week: What the Gospels Really Teach About Jesus's Final Days in Jerusalem, HarperSanFrancisco, 2006. Boring, Eugene M., The New Interpreter's Bible, vol. VIII, Matthew, Abingdon Press, Nashville, 1995. Grant, Frederick C., The Interpreter's Bible, vol. VII, Mark, Abingdon Press, Nashville, 1951. Johnson, Sherman E., The Interpreter's Bible, vol. VII, Matthew, Abingdon Press, Nashville, 1951. Malina, Bruce J. and Rohrbaugh, Richard L., Social Science Commentary on the Synoptic Gospels, Fortress Press, Minneapolis, 1992. Perkins, Pheme, The New Interpreter's Bible, vol. VIII, Mark, Abingdon Press, Nashville, 1995. Roe, Helen M, The High Crosses of Kells, Meath Archaeological and Historical Society, 1988.